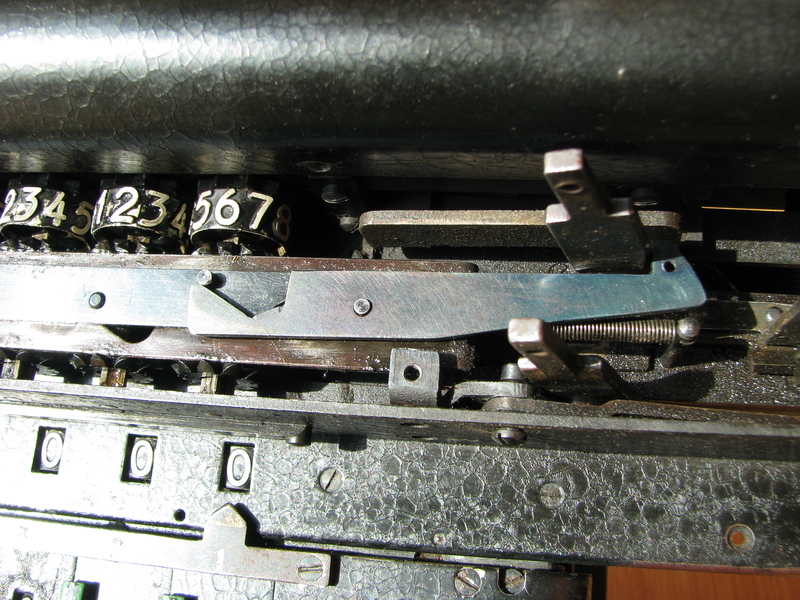 Rheinmetall names have a certain logic to it - the simple handcranked models are named I or II depending on the number of places in the result register (12/13 or 16/17), with a minuscule letter behind the roman numeral signifying the number of keyboard columns. (6=b, 7=d, 8=e, 9=f for type I 8=a, 9=c for type II). That makes this machine a "Ie". 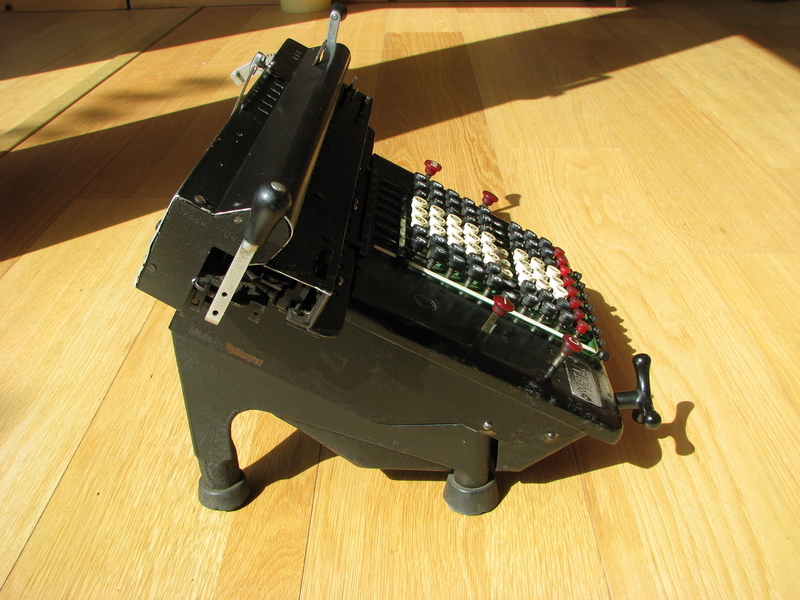 The electric models were named K for "Kleinrechenmaschine", E for "Electric", D for "Division" - (half-automatic division, that is), W for "Wagentransport" (automatic carriage movement), L for "Löschung" (automatic clearing) and S for "Speicherwerk" - extra memory bank, with item counter, and backtransfer from memory to result register. 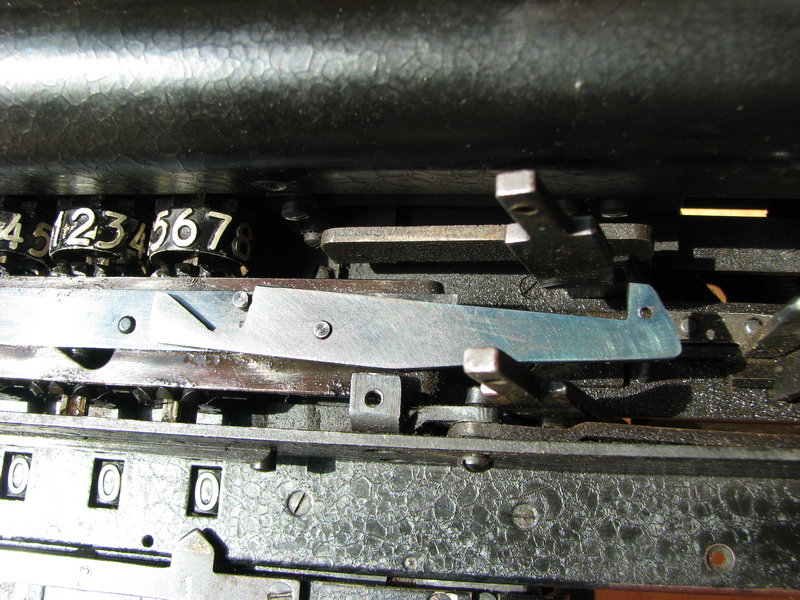 An additional letter "R" (for "Rückuberträgung") was added behind the type designation if the machine also had backtransfer from the result to the input register. So dissection of e.g. the name KEWS leads to an electric machine with automatic carriage transport and extra mamory bank with the associated functions, but no electric clearing. 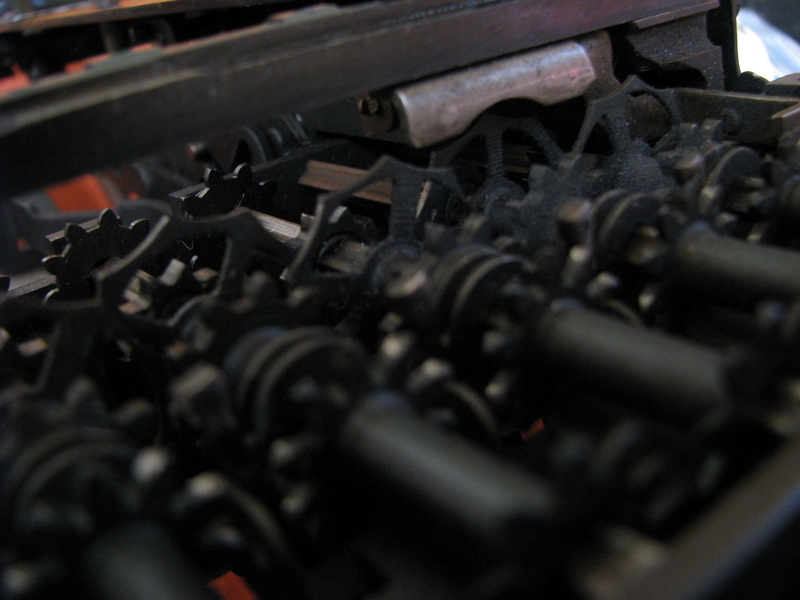 If a Rheinmetall machine has fully automatic division, it is a "Superautomat", which supersedes the K and the E - so a KEWS with fully automatic division becomes a SAWS. So...what about this machine then ? It is non-electric, but has an extra memory bank. That would make it a model "IeS", a machine that occurs nowhere in the known Rheinmetall documentation, and resulted in the comment "Never seen that before ..." from a factory-trained Rheinmetall service technician. It turns out there is a good reason for that. The machine as it is now came from France - or at least part of it did. It was used by a mining engineer near Paris, and when I bought it it was essentially thrown in a cardboard box, some apologetic wads of paper thrown in with it, and sent on its merry way. On the way here, the machine was banged up pretty badly, and at some point it fell through the (unreinforced ...) bottom of the box and probably off the conveyor belt or something. When it arrived, literally nothing remained whole. 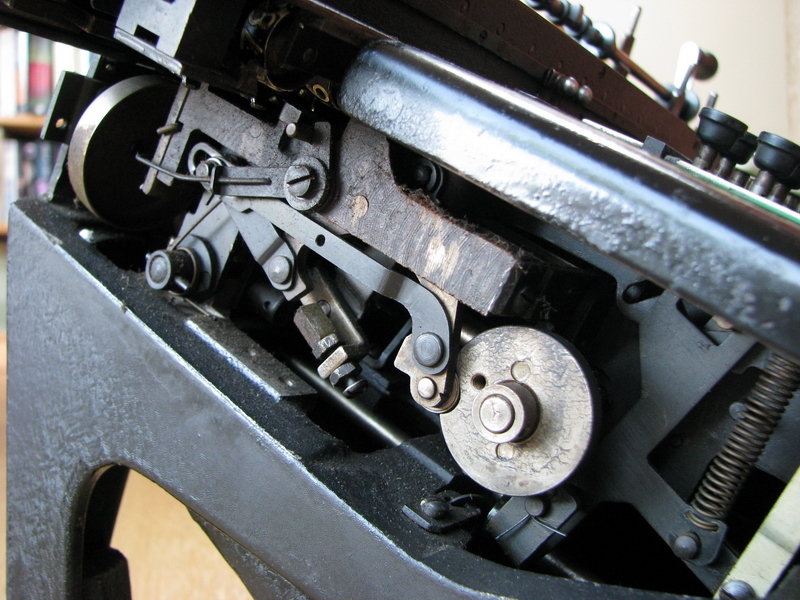 The main frame of the machine was broken, all the sheet metal and handles bent, the triple screw for carriage transport had all the arms broken off, and the carriage itself had come off as well, breaking an all-important cast part inside in the process. So in short, a total massacre. The seller was completely clueless, and although very sorry about the whole situation, seemed to think that it was somehow my problem, and that surely the insurance of the carrier would help out, as they had not been careful enough. DHL had one look at the photos on receiving the claim and probably nearly died laughing. Some people are really beyond rescue and/or education. Note to self - don't buy calculators from them! 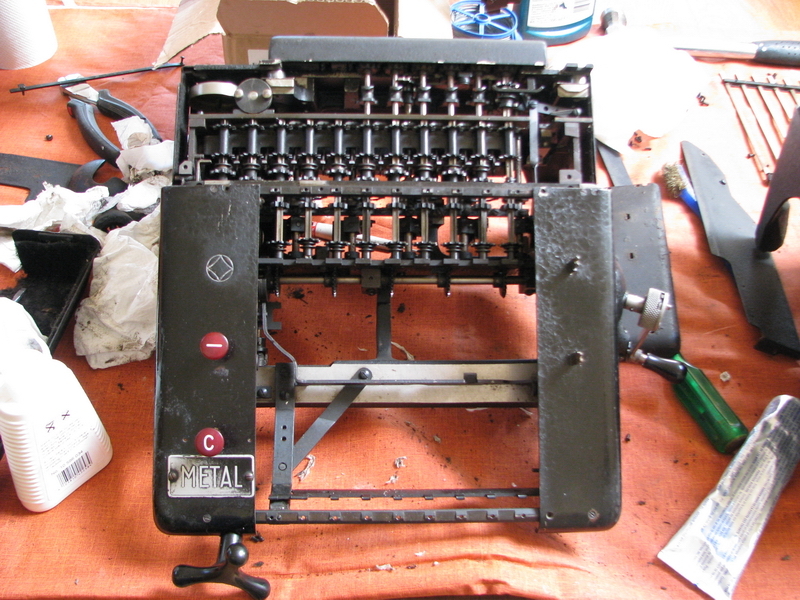 In any case, the machine sat around for a while, as I was reluctant to start the restoration without a clear idea of how to solve some of the issues. 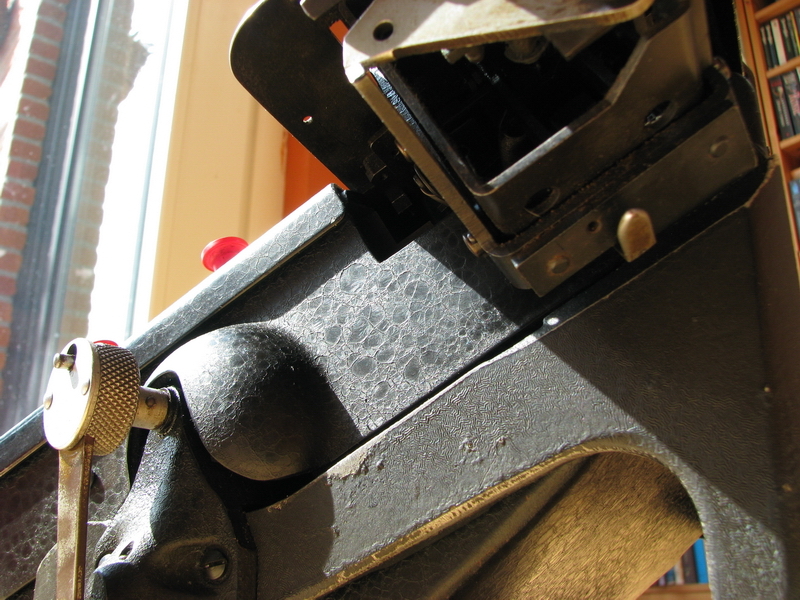 Then I acquired a second derelict Rheinmetall machine cheaply from the Brussels area (a Id). 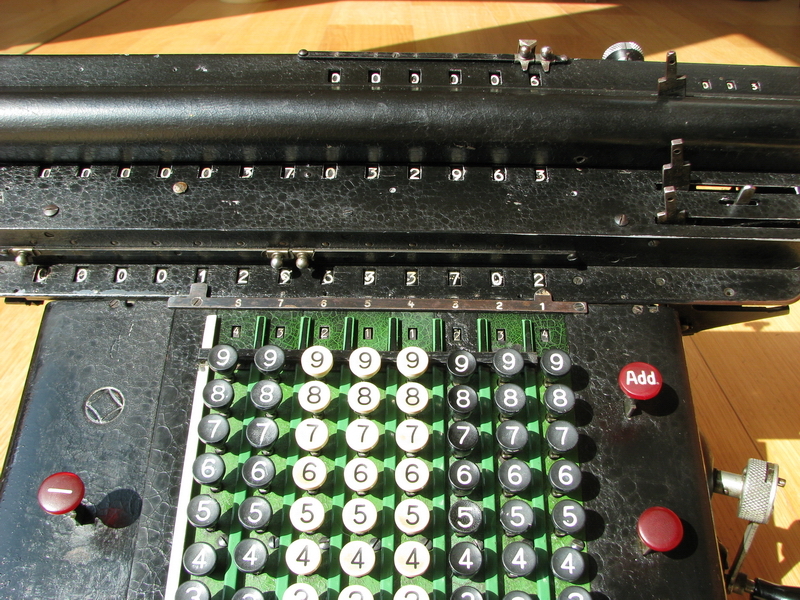 It also had a lot of problems, but I didn't think there were any that I couldn't solve by combining the two machines. 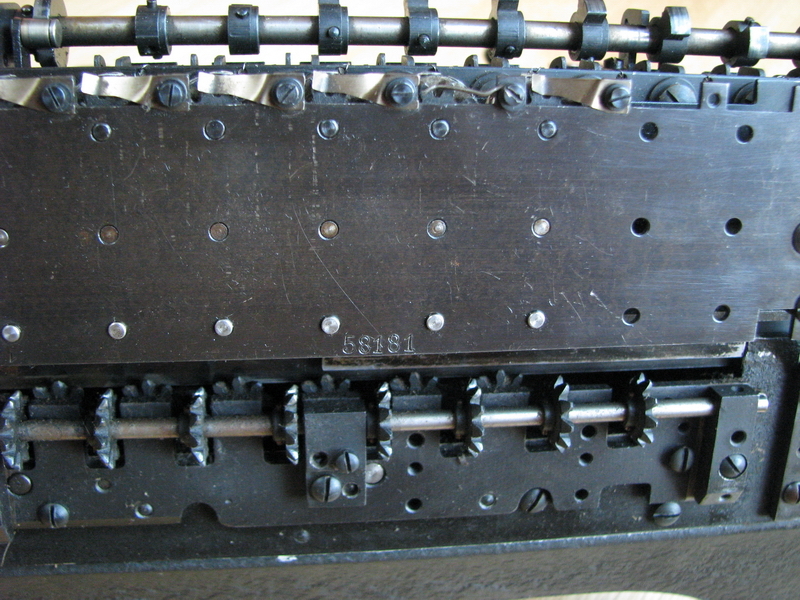 It came with the standard carriage, so the first step in the restoration was to exchange the broken part in the carriage of the french machine, and make the "S" carriage fit on the main body of the Brussels machine. 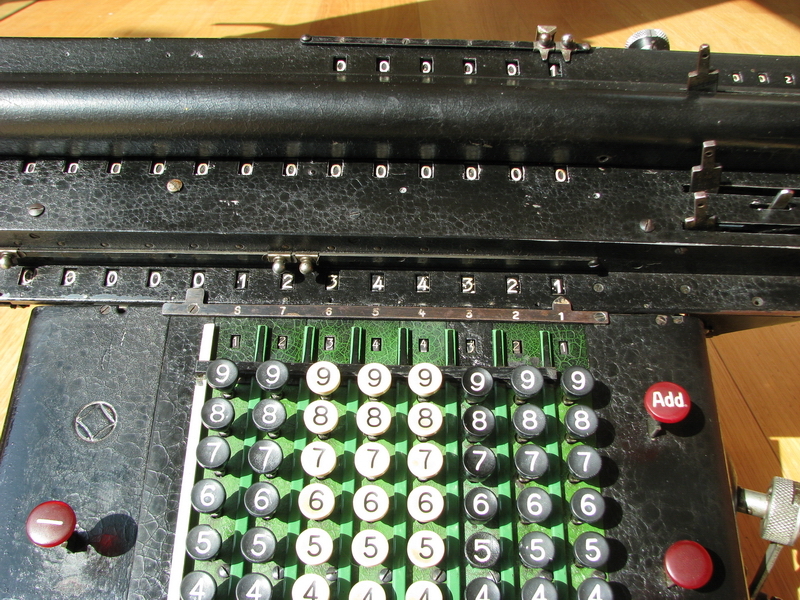 This is where it became interesting, and to see why, we need to look at the serial numbers. 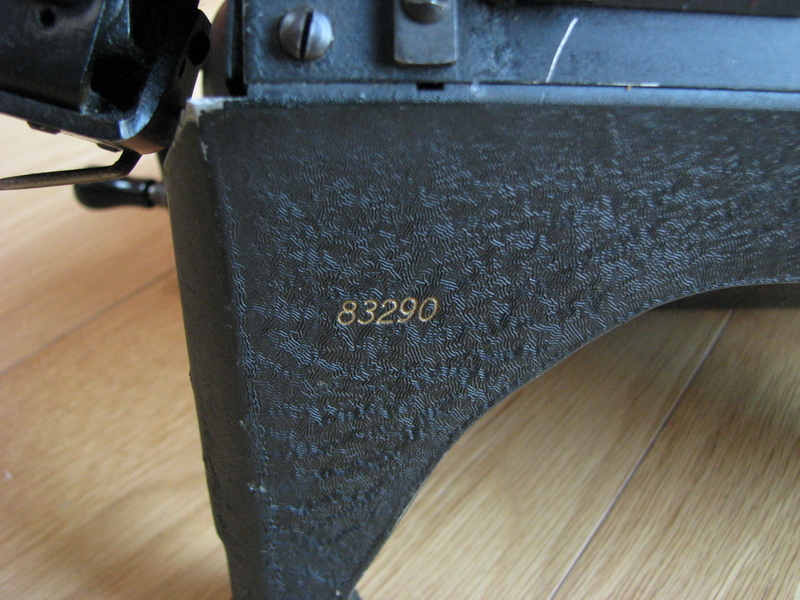 The "S" carriage had serial number 58.181. 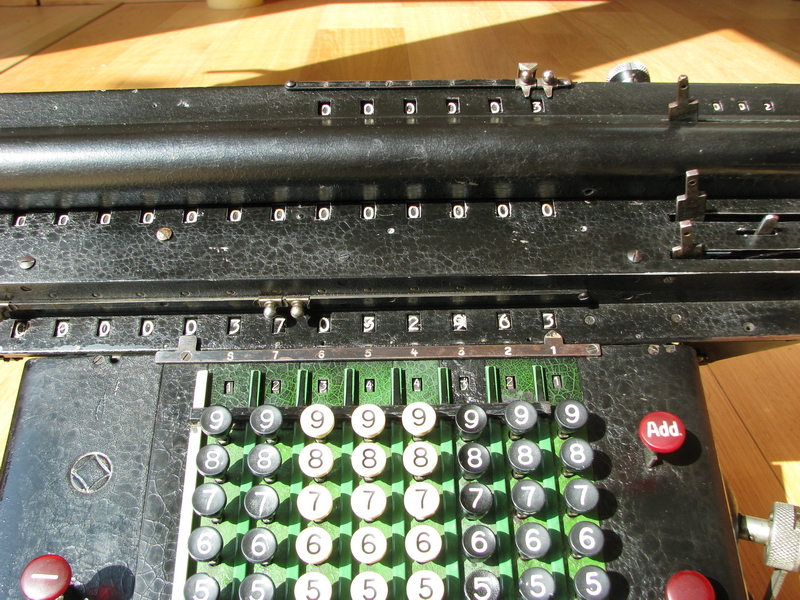 The Brussels machine was much later, with serial number 83.290. A number of modifications had been made, and according to my factory trained Rheinmetall mechanic friend, the main reason was to make the later machines cope with electric drive at 375 rpm. 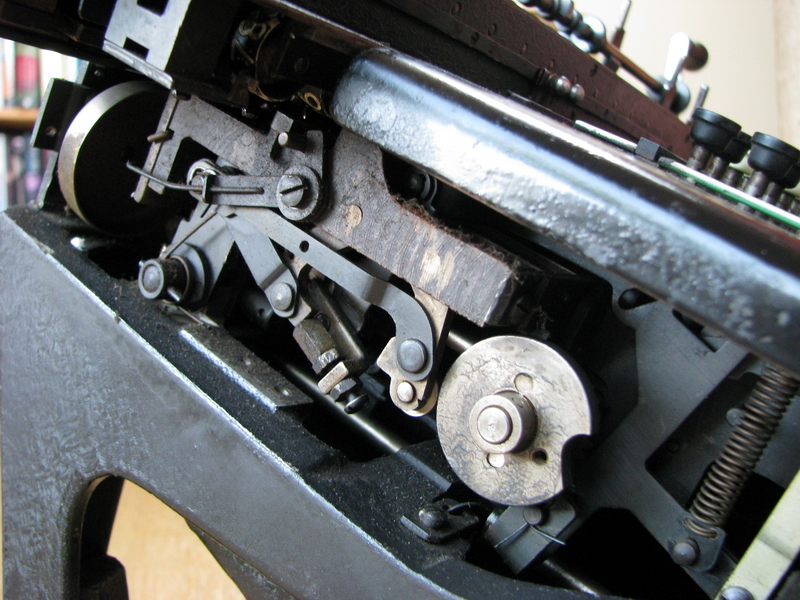 The Brussels frame thus had an extra protection against inertial overcounting, which was interfering with the movement of the "S" carriage and had to be removed. There are other differences beween the machines, and for the same reason, quite visible in the picture below - several parts were lightened. 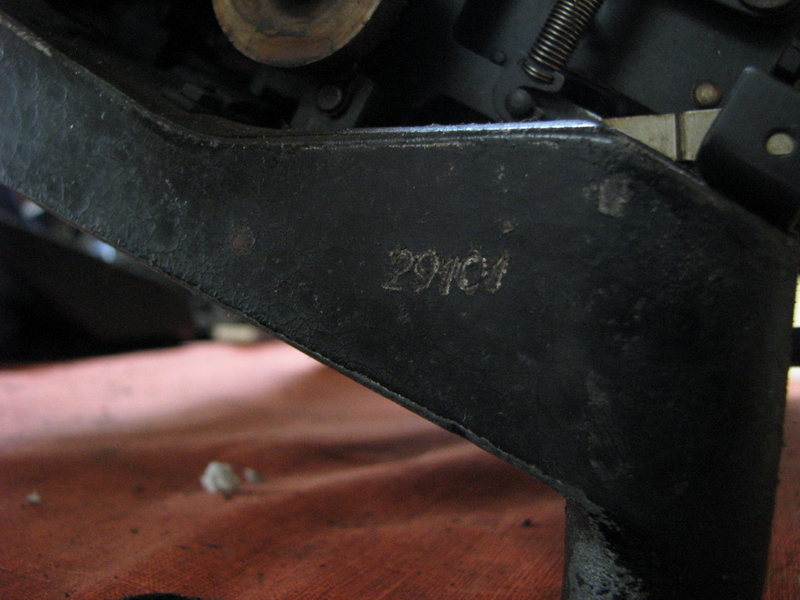 However, then I found a serial number on the french machine main body that was quite different from that of the S carriage that came with it - its number was 29.101. So the machine I originally bought was already a "bitsa" machine, the "S" carriage probably came from an electric machine with a malfunction, and its carriage had later been mated with a manual body. These french mining engineers, do not underestimate them! Now however, I'm happy to say that everything fits, and the broken cast part in the carriage that needed changing also fit without any further issues. 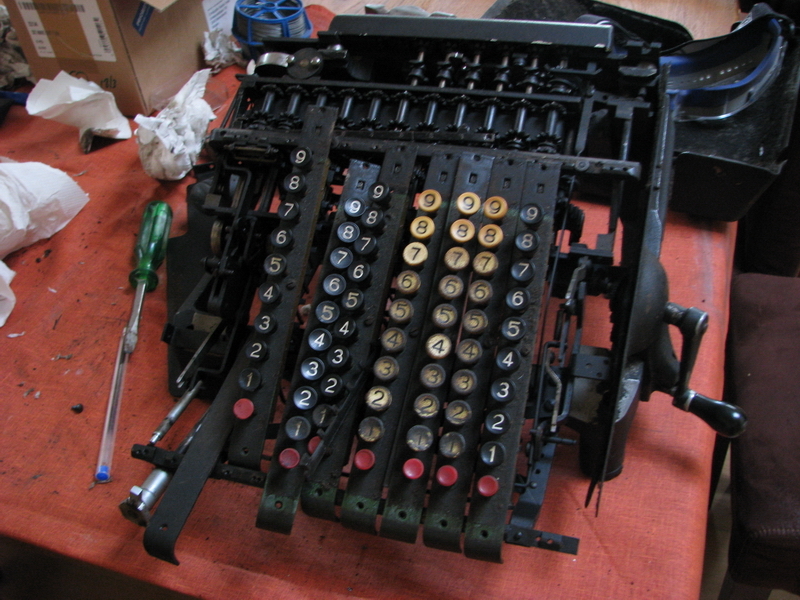 This is a picture of the machine in its cobbled-together, but unrestored and uncleaned state. At this point in time, I met up with an 88 year old factory trained Rheinmetall service technician. He immediately grabbed a screwdriver, proceeded to mutter "there is a serious lack of oil in this machine", and took the covers off the S carriage to investigate why things needed so much force to move. After bending back a few parts that had been damaged in transport, things started to move much better. Then he remarked "There is a part missing here!" 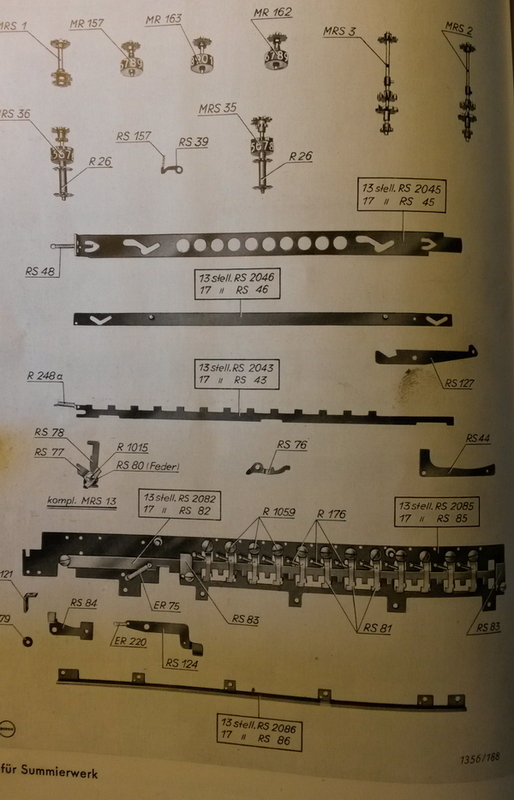 Sure enough, he took out the parts catalog for the S carriage, and after some page flipping said - "This is the part that is missing. You are not supposed to be able to clear or transfer the contents of the memory bank when the result register is set to negative." 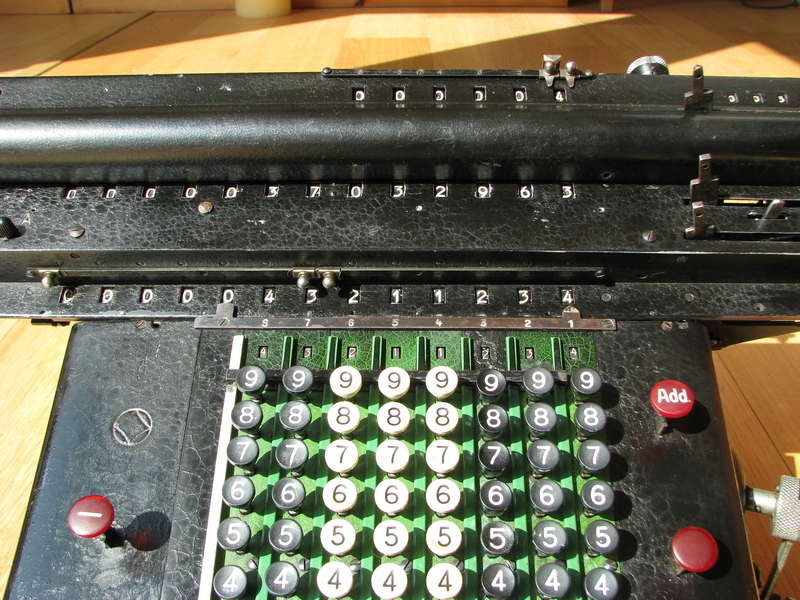 While on subtraction, it moves up and blocks the clearing of the memory. 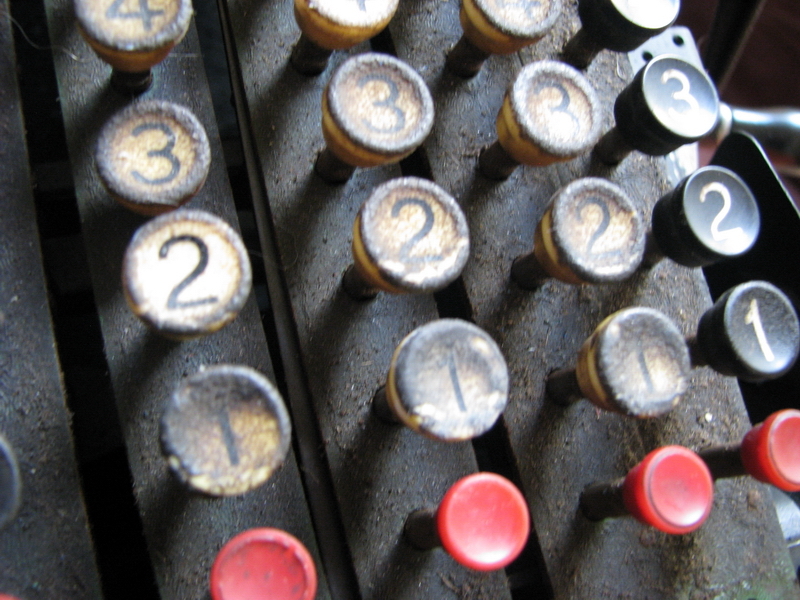 As mentioned, some of the keyboard rows were blocked. He also spotted that one of the blocked rows was due to an arm in the tens transfer mechanism having slipped out of its slot. Five seconds later, this was also remedied. He then sent me home, where I proceeded with a full day of cleaning, oiling, adjusting, and switching parts from one frame to the other, including the entire keyboard and covers, so it now carries the french "METAL" brand. The name change had something to do with the French not being too keen on buying German machinery after the Great Difference of Opinion in 14-18. 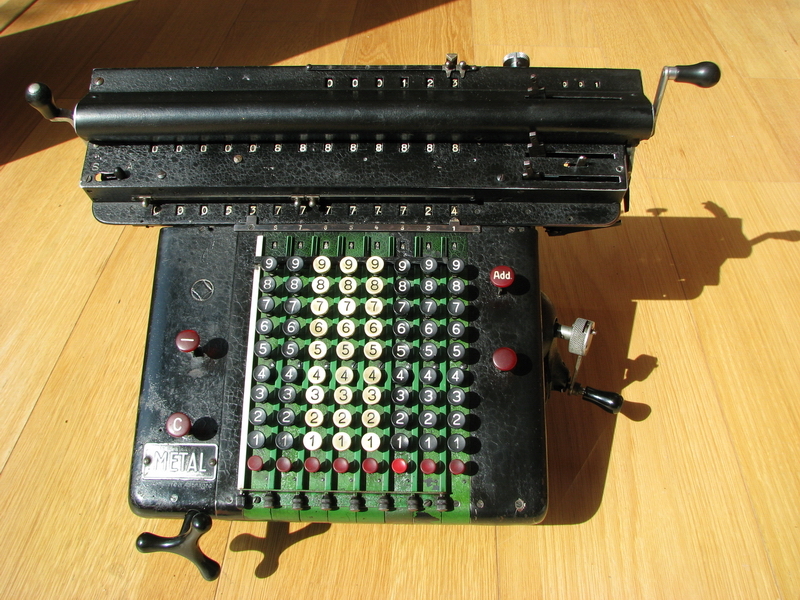 The keyboard of the Brussels machine was ruined completely, probably by trying to clean it with solvent. 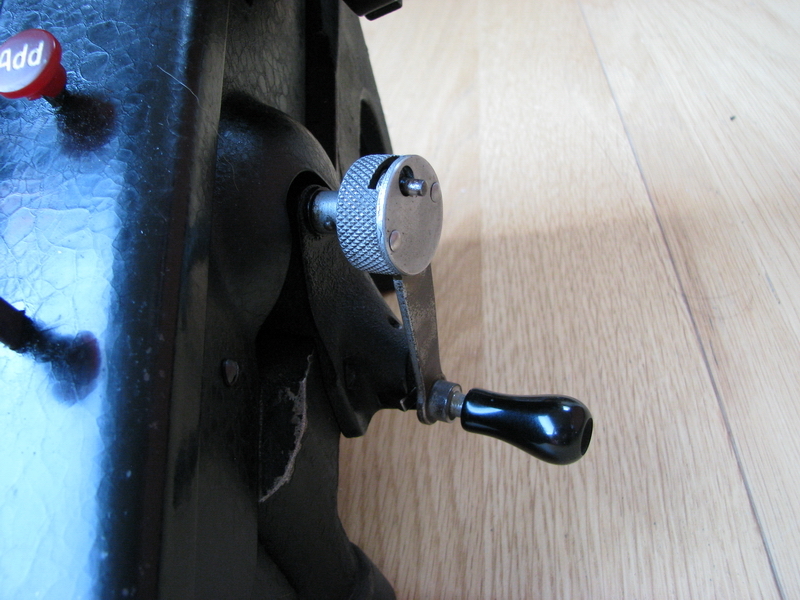 Also the crank handle was switched, since the Brussels base had a fixed handle, and the french machine had a more interesting removable handle, which is now mounted on the other frame. 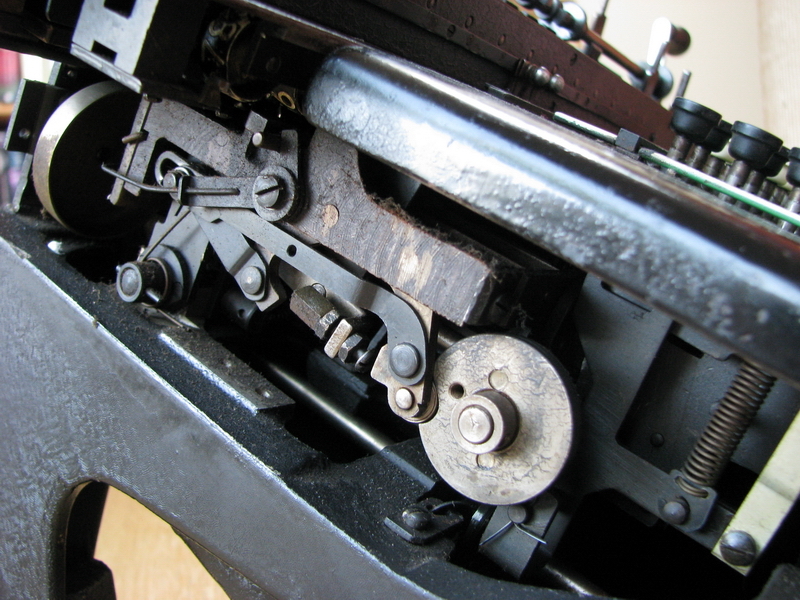 Look at the handles immediately to the left of the round disk, and the haphazard looking pile of parts in between. 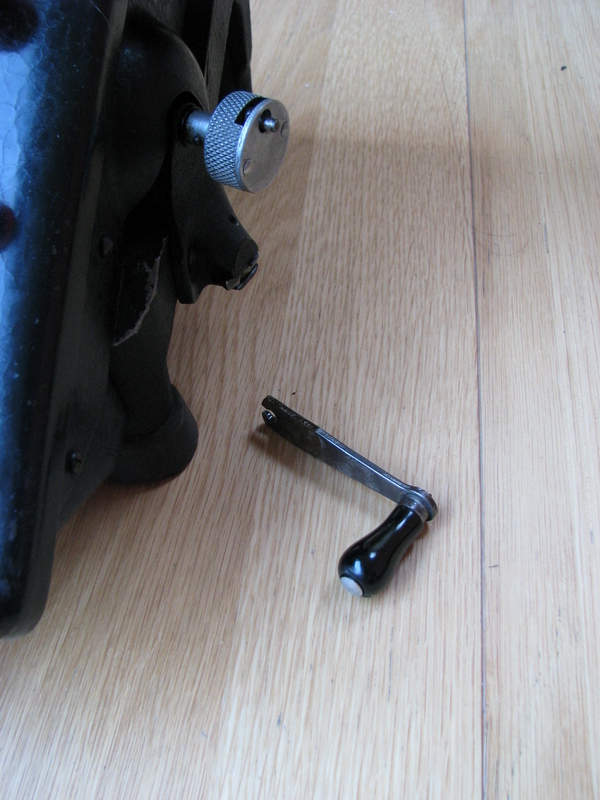 The reason why it looks haphazard is because it has two spacers on each side, each locked with a hexagonal locknut. The left side regulates the movement for subtraction, the right side for addition. This is on crank rotation - the left handle moves to the right, and on full extension, the middle part needs to be regulated in such a way that the upwards movement of the counting gears is in the goldilocks zone - not too much, not too little, but just right! 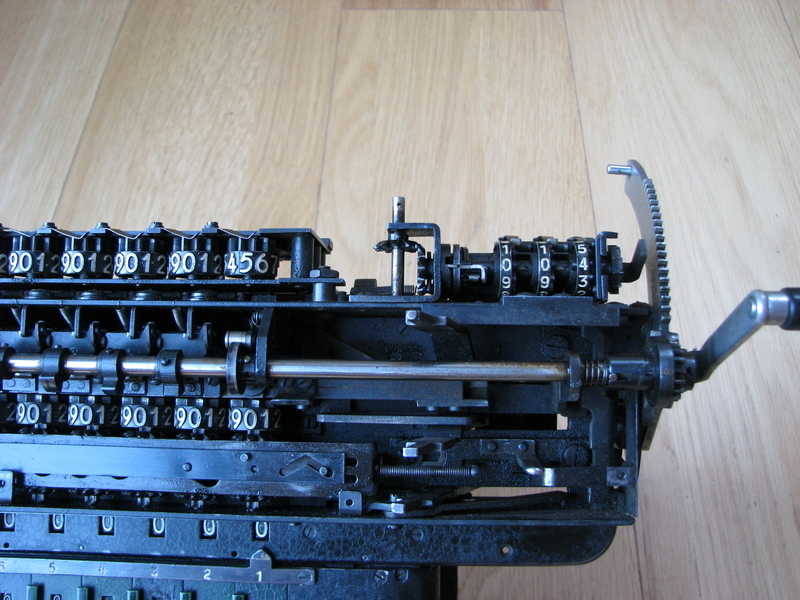 Now on addition, the middle part moves up, so it is in position for moving the counting gears down, moved by the addition arm on the left. Five tense minutes later, all was fine, and the machine now works as intended. There are of course some leftovers from the other machine ... I may turn it into a demonstration model. 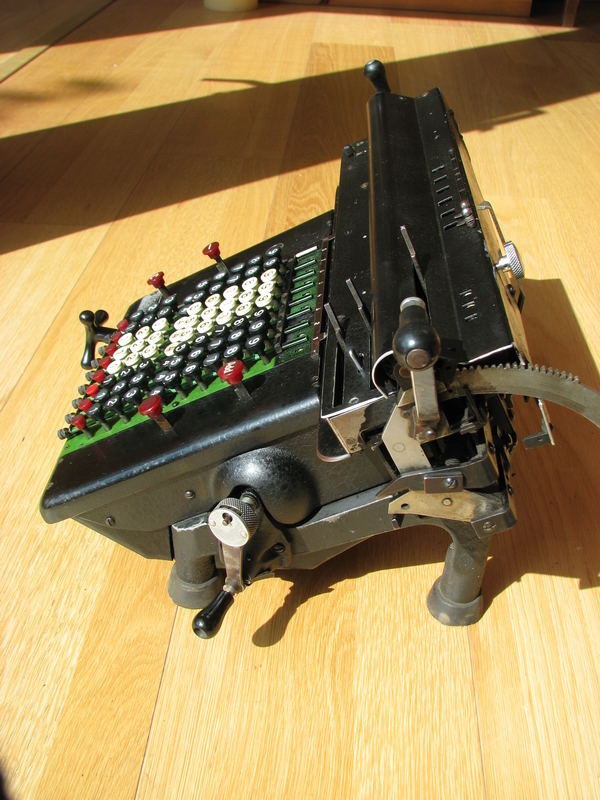 Now, the portrait of the machine after its restoration. I hope you will agree with me that it looks much better. Finally, something on the capabilities of this machine and how to operate it, because it can do plenty of interesting things. First, the layout of the carriage. on top of the keyboard is the input control register. 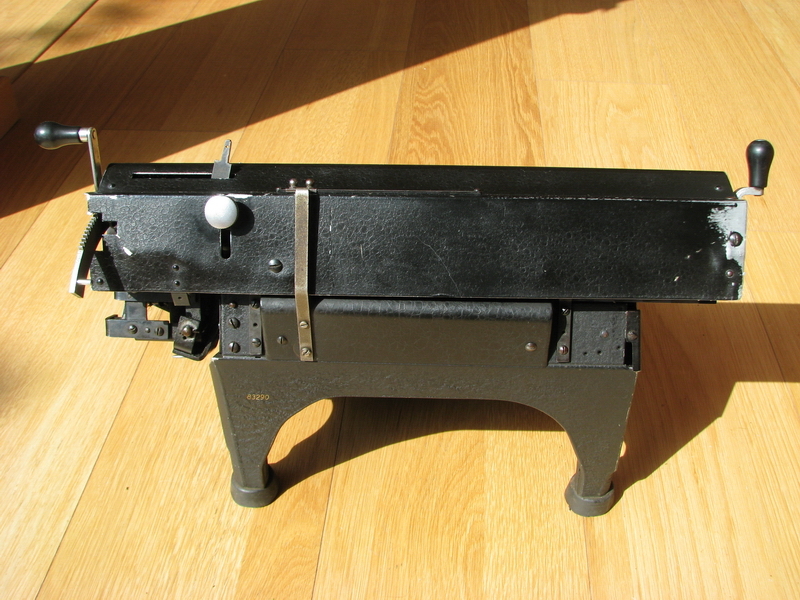 The lower register in the carriage is the result register. I have summed 12344321 into it. Clearing of the result is to the right. Over the result register, under the pilot-whale like bulge which houses its tens' carry, is the memory bank. We'll get back to this. All the way up top is the counter register. 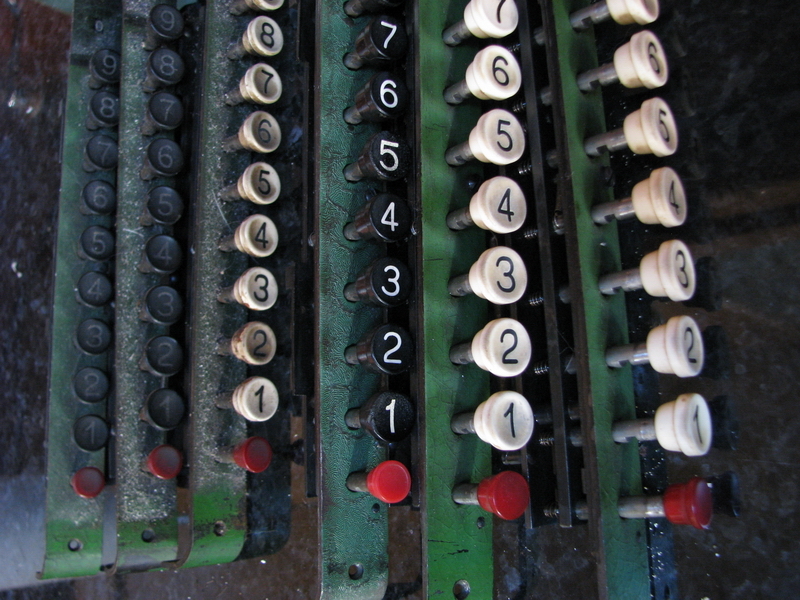 And to the left of the counter register is an item counter, which registers how many times the large lever at the right of the carriage has been pulled in order to transfer the contents of the result register to the memory. 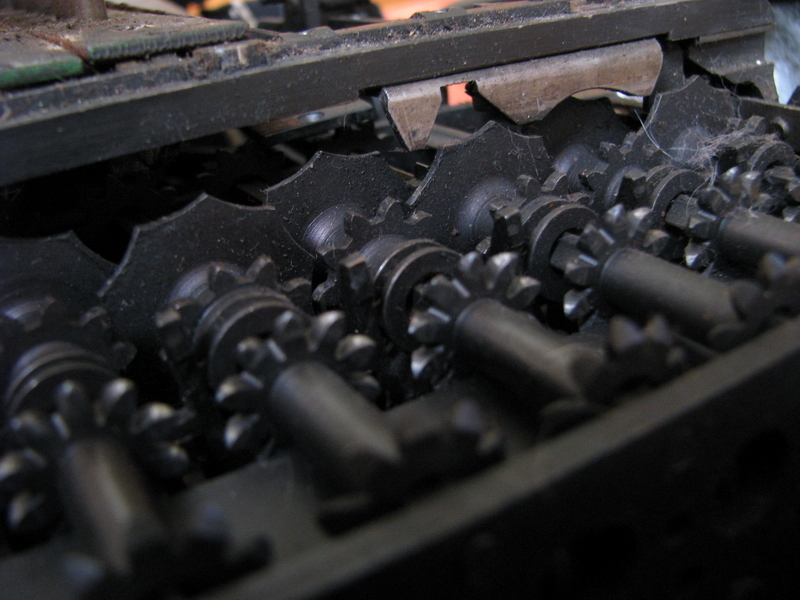 It is cleared by the aluminum knob at the back of the carriage, and for this series of pictures, I forgot to reset it. 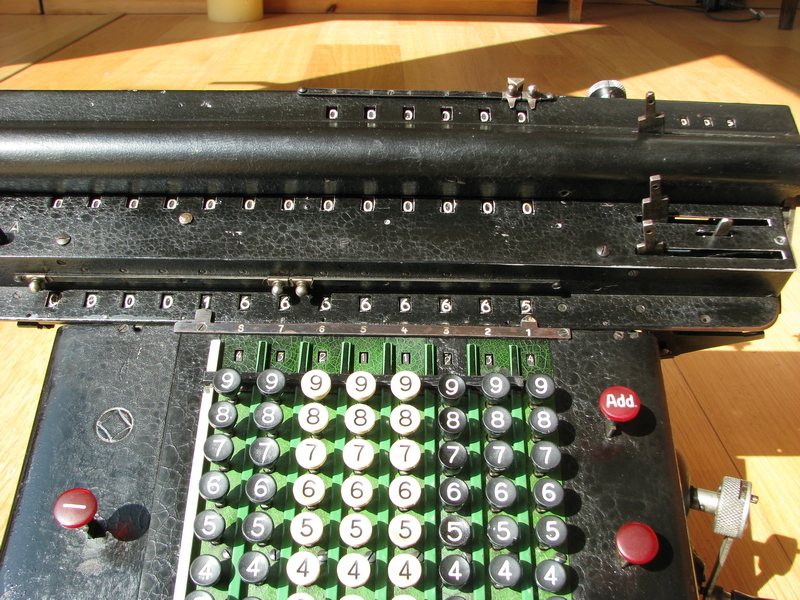 Now I've made another two additions of 12344321 into the result, the counter register is at 3. Next, I pull the large lever at the right of the carriage all the way forward, transfering the contents of the result register into the memory bank. The small item counter up top goes from 2 to 3. 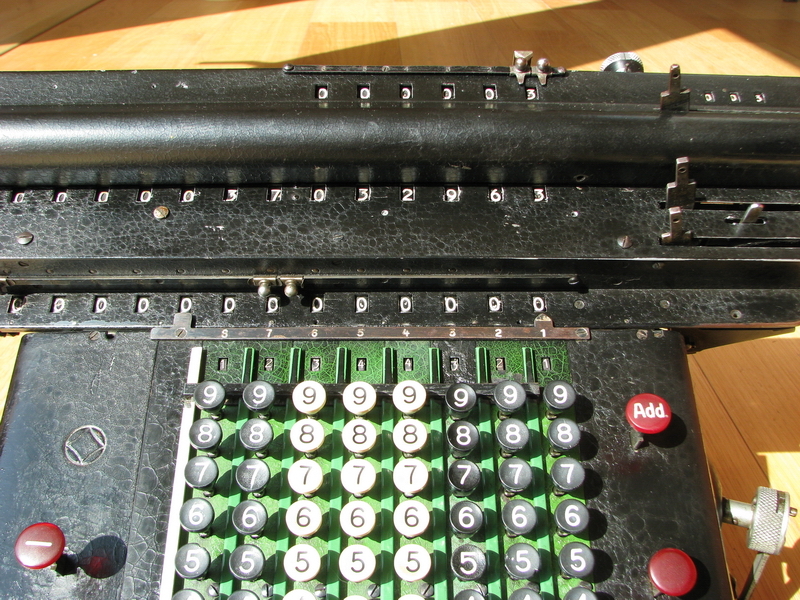 Note that the counter register is also still at 3, it has not been reset - if I flip the nickeled lever at the bottom of the carriage to the other position, the counter register will automatically be cleared as well when transfering a result to the memory. 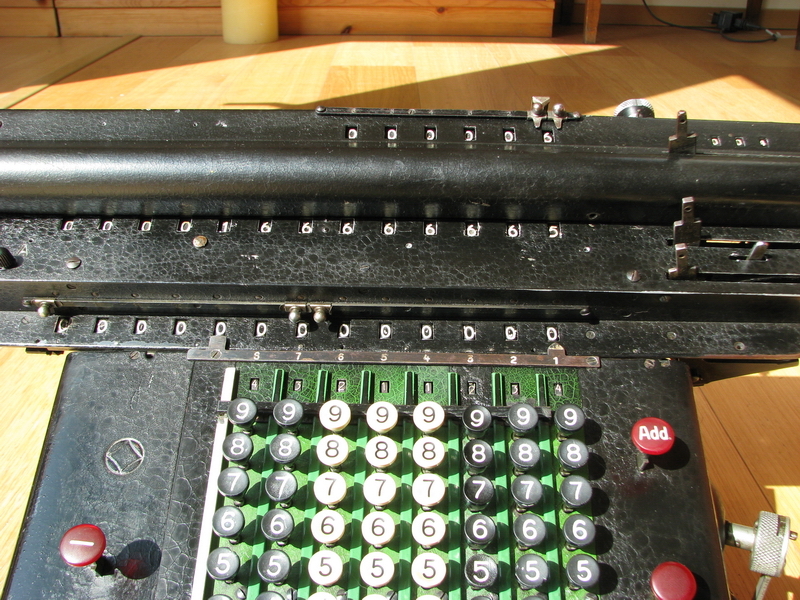 We again pull the large lever on the right, adding the result to the memory, and we get 166666665, as expected, and the item counter is up to 4. 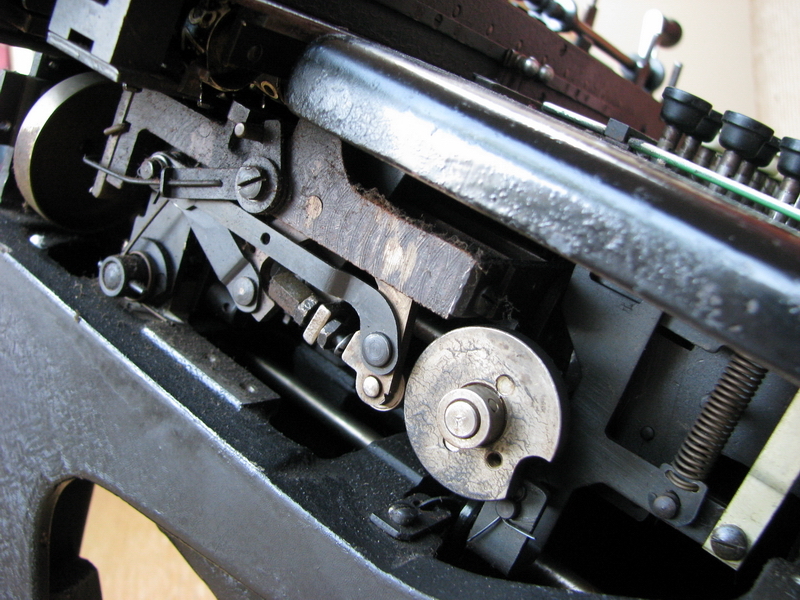 The bulge in the carriage contains a rotating axle with tens' carry cams, so tens' carry is always correct in both directions in the memory bank, either in addition or subtraction. 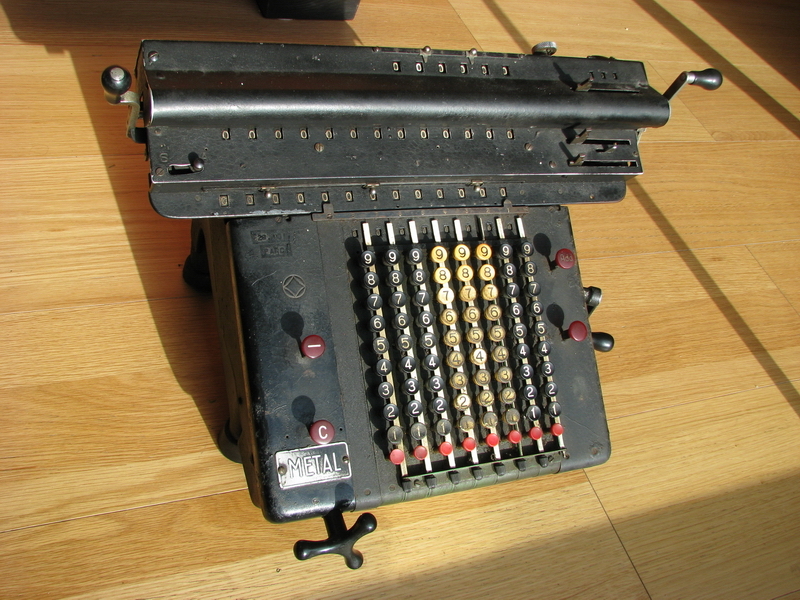 By flipping the small black switch at the left from "A" to "S", the contents of the result register can also be directly subtracted from the total in the memory bank. 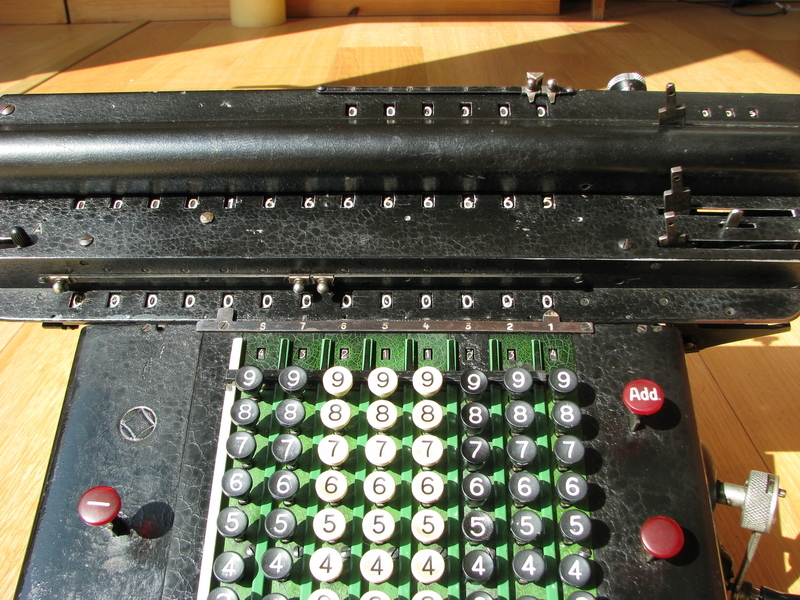 Next, we clear all registers except the memory, and flip the small chrome switch between the clearing levers for result and memory to the left. If we pull the memory clearing with the switch in this position, the contents of the memory will be transfered back to the result register. The part I had to make prevents this happening if the memory is in subtraction mode, because that would screw everything up. The compound total in the result register can now be used for e.g. a division. The Rheinmetall "IeS" is a beautiful machine, probably unique in the world, and I am very happy with it - it certainly took me enough work too!